You May Be A Drug Supplier Without Knowing It! Studies show that more teens start using drugs during the summer months - while unsupervised and with more free time. 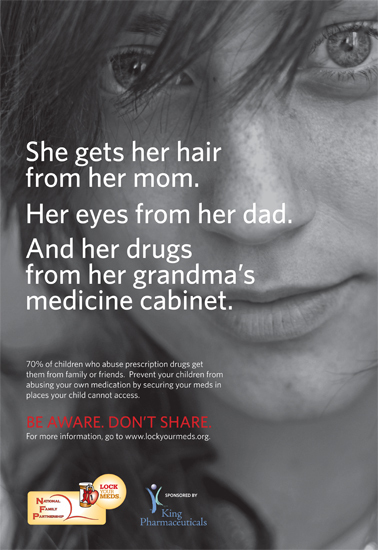 More than 70% of teens who abuse prescription drugs get them from family and friends, usually from the medicine cabinet at home. Sixty-eight percent of households do not properly secure their medications. Safeguard all medicines by monitoring quantities and controlling access. Remove drugs from your medicine cabinet and lock them up. Take inventory of your medications and check them regularly. Warn your youngsters that prescription drugs can be just as dangerous, addictive, and lethal as street drugs. Studies show that teens dangerously view prescription drugs as "safer" to abuse than illicit drugs. Properly dispose of old or expired medicines in the trash. Hide or mix them with cat litter or coffee grounds before throwing them away. Don't have kids at home? What about your grandchildren, nieces and nephews, and your friends' kids that visit your house? The CDC lists prescription drug abuse as the fastest-growing drug problem among 12-17 year olds. One in five high school students in the U.S. admits to having taken a prescription drug without a prescription. The number of teens going into treatment for addiction to prescription drugs has increased by more than 300%. Emergency room visits for prescription drug abuse have more than doubled since 2004, 48% of all ER visits for prescription drug abuse are by young people ages 12-20. Prescription drugs are now involved in more overdose deaths than heroin and cocaine, combined. Lock Your Meds™ is the new national campaign from the National Family Partnership (NFP) to inform families that they are frequently the "unintentional suppliers" of prescription medications being abused by young people. The NFP is the largest and oldest drug-prevention group in the United States, and in 1988 developed "Red Ribbon Week" into the annual campaign that now reaches more than 80 million people each year, mobilizing parents, schools and communities. As the nation's oldest and largest drug prevention group, NFP is committed to keeping families informed.